Polish Pottery Dish with Cover - Made in Poland, these stoneware dishes are great for serving and display. 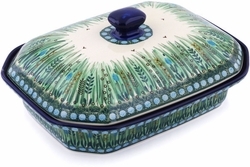 This Polish Pottery covered dish is ideal for serving home-cooked casseroles, meats, stews - it holds the heat longer because it's stoneware! This covered dish is beautifully decorated and makes a stunning centerpiece. Boleslawiec pottery is painted by hand by talented artisans at famous Ceramika Artystyczna factory, so no two pieces are identical.